Pes Anserine Bursitis causes pain on the inner side of the knee, approximately 2-3 cms below the knee joint. It typically affects athletes especially runners and swimmers due to overuse, or overweight middle aged females due to increased pressure through the bursa. Pain from pes anserine bursitis usually develops gradually rather than suddenly and tends to get worse with activities such as stair climbing and running. There are a number of things you can do to aid the healing process and stop the problem from coming back. Here we will look at the causes, symptoms and treatment options for pes anserine bursitis to help you make a full recovery. 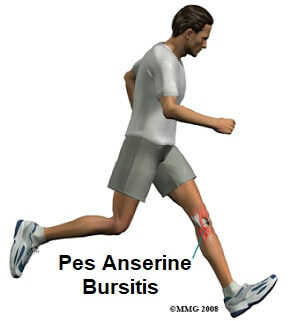 Pes Anserine Bursitis is when there is inflammation of the pes anserine bursa, causing medial knee pain. The pes anserinus is an area on the medial (inner) side of the knee where three muscle tendons attach to the tibia (shin bone). Sitting underneath this conjoined tendon is the pes anserine bursa, a small sac filled with fluid. The bursa is there to reduce friction between the tendon and the tibia as the knee moves by providing cushioning and allowing smooth gliding movements of the tendon without any friction. 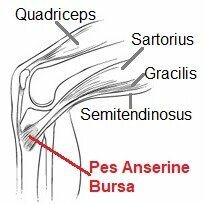 What Causes Pes Anserine Bursitis? Activities where the three muscles are being used repetitively, such as in running (particularly uphill), cycling, swimming (particularly breaststroke), and side-to-side movements can cause friction and pressure on the bursa. Weakness and/or tightness in the hip and knee muscles can place increased tension on the pes anserine tendons which damages the tendon itself and increases pressure on the bursa. Tight hamstrings are a common cause of pes anserine bursitis. Training errors such as sudden increases in distance or intensity, not warming up and inadequate stretching can over stress the area. Joint inflammation associated with arthritis can cause swelling of the bursa. Studies have shown that approximately 20% of people with osteoarthritis of the knee suffer from pes anserine bursitis. People with Type 2 Diabetes or Osgood Schlatters are also more likely to develop bursitis. Pes anserine bursitis is more common in women, due to a wider pelvis and the angle of the knee joint. Pes anserine bursitis is often accompanied by tendonitis where small tears develop in the pes anserine tendon. It is hard to clearly distinguish between the two problems, but the causes, symptoms and treatment are basically the same for both. The most common symptom of pes anserine bursitis is pain and tenderness on the inner side of the knee approximately 2-3 inches below the joint. Symptoms of bursitis tend to build up gradually rather than suddenly. People often complain it hurts more when they exercise or go upstairs, with resisted knee flexion or when they stretch their hamstrings. When the pes anserine bursa is inflamed, there will often be some swelling and redness over the area and the inner side of the knee may feel slightly warm to touch. Sleep is often affected by knee bursitis, particularly if you sleep on your side with your legs together placing pressure on the bursa. You may be woken by pain when you roll over as you bend or straighten the knee. It can help to sleep with a pillow between your knees to provide some cushioning to the pes anserine bursa. Pain from pes anserine bursitis often limits movement so the knee gradually loses strength and range of movement. Stiffness and weakness develop which can then make it more painful to move. Symptoms may develop suddenly if there has been a direct blow to the knee, but it is worth considering other possibilities such as an MCL sprain if the pain develops suddenly. Most cases of knee bursitis are self-limiting. There are a number of things you can help to reduce the pain and inflammation and the main aim is to reduce the pressure on the pes anserine bursa so the healing process can kick in. Treatment for pes anserine bursitis should address both the symptoms of the problem (the pain and inflammation) as well as the underlying causes (e.g. muscle tightness or weakness). 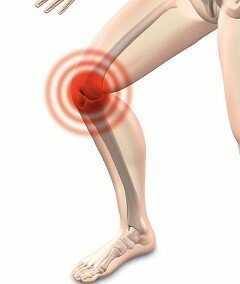 With knee bursitis it is really important to avoid activities that cause pain. This may mean modifying your activities or indeed stopping some altogether to allow the swelling to settle down. Applying an ice pack for 10-15 minutes, every couple of hours, to the inner side of the knee can help to reduce pain and swelling associated with pes anserine bursitis. There are a number of different ways to apply ice to the knee – see the knee ice wraps section for more information including how to use ice safely and effectively. Anti-inflammatories such as ibuprofen and painkillers such as paracetamol can help to reduce pain and inflammation with knee bursitis. Always check with your doctor before taking any medication. Pes anserine bursitis is often caused by tightness in the hamstrings so performing simple stretching exercises is a really important part of the treatment process to take the pressure off the bursa. Visit the hamstring stretches section to find out the best ways to effectively stretch the hamstring muscles. It can also help to stretch the surrounding muscles too – visit the knee stretches section to find out more. Weakness in the hip and knee muscles makes subtle changes to the way the forces go through the knee, so by strengthening the glutes, quads and hamstrings, you can ease the pressure on the pes anserinus bursa – visit the knee strengthening exercises section for loads of great exercises that can help. A physical therapist can assess for any areas of weakness and tightness that may be contributing to the problem and work on a rehab programme with you. They may also use treatments such as ultrasound and acupuncture to help reduce pain and inflammation with knee bursitis. Your doctor may recommend a corticosteroid injection to help reduce the pain and inflammation associated with pes anserine bursitis. An injection may give instant pain relief but should be used in conjunction with other treatments such as physical therapy and exercises to make sure the problem doesn’t return. 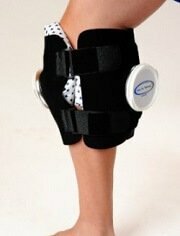 You can find out more about how they work and the risks and benefits in the knee injections section. In rare cases, if the pain fails to settle with the above treatments your doctor may advise surgery to remove the pes anserinus bursa. You normally go home the same day and may need to use crutches for the first couple of weeks. It normally takes around three to four weeks to return to your normal activities. As the pain settles, you can slowly start returning to your normal activities but take care not to push things too much too quickly. Start with non-weight bearing exercises such as cycling or swimming. If you want to return to running, start with short distances alternating between running and walking, gradually building up. A good rule to follow is the 10% rule where you increase your training by a maximum of 10% a week, be that distance or time. Remember, you won’t always notice pain when you are doing an activity, often the pain will come on later that day or the next, so allow yourself adequate rest. If at any point you start noticing the pain again, that is your bodies way of telling you you are overdoing it, so cut back your training until it is pain-free. It usually takes two to three months for the symptoms of pes anserinus bursitis to completely settle by which time you should be able to return to your usual activities. There are a number of other things that can cause pain similar to pes anserine bursitis, such as an MCL tear, stress fracture, arthritis and cartilage tears. Bursitis can also affect different parts of the knee - see the knee bursitis section to find out more. If this isn’t sounding quite like your problem, visit the medial knee pain section for help working out what is wrong.